Last week, The Walking Dead told of the travails of two groups of survivors as they foraged for supplies for the Prison community, most of whom have been quarantined due to an outbreak of Scary Megaflu. 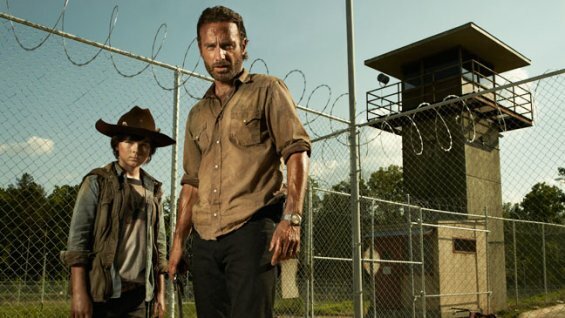 Rick and Carol searched for cough drops and food at a local residential area, but only as a pretense to let Carol quietly exit the group as punishment for her murder of the Infected. Daryl, Michonne, Tyreese, and Stookey traveled to a veterinary college for some antibiotics — but not without revealing the depths of Stookey’s alcoholism — and at the end of the episode were on their way back to the Prison. 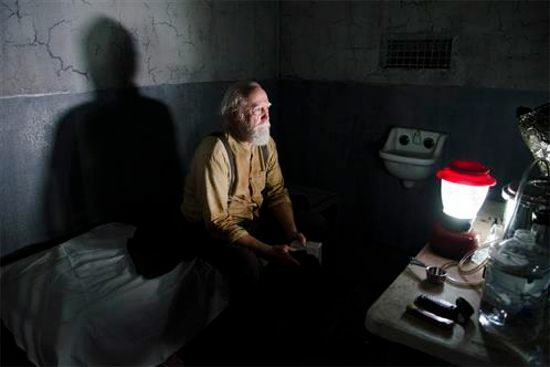 This episode told the story of those left behind, primarily Hershel who had broken quarantine to treat the Infected. In this episode, we find that his treatment consists primarily of liberal application of the elderberry tea he has prepared from berries collected in the woods a few episodes back. The theme of this episode was the apparent necessity and futility of fighting the inevitable (hence, the title of my post), and centers around Hershel who finds himself repeatedly in this position. The episode opens with Hershel desperately force-feeding something (elderberry tea?) down the throat of a red-headed survivor dying from the Megaflu. Hershel’s actions seem futile — a fact he is unwilling to admit — and the apparent pointlessness of his actions are underscored by his discussion with Dr. S., the community’s actual doctor. Dr. S is in the end-stages of Megaflu, and has locked himself in his cell waiting for death. Convinced that there is no hope, Dr. S. spends his final moments waiting to die rather than caring for the other patients. Dr. S.’s fatalism is contrasted against Hershel’s faith that Daryl and the others will arrive in time to save the Infected; appropriate since Dr. S. is depicted as a man of science who fully comprehends the deadliness of the disease he and the others have contracted. This has led Dr. S. to the chilling conclusion that the Megaflu is unstoppable and that death is inevitable. He therefore urges Hershel to stop treating the Infected, and to instead lock the cells and wait for them to turn. Why, after all, waste time on those condemned to die? Instead, lock the Infected up and throw away the key. Dr. S.’s solution would probably work to end the Megaflu outbreak. But, like Carol’s heartless solution — to sacrifice the sick to save the living — it is fundamentally inhumane: a fact that Hershel of all the survivors is best equipped to explore with us, the viewer. Remember that it was Hershel who locked the Walkers in his barn because he hoped there might still be a cure; it was Hershel who first sounded the alarms of Carl’s growing heartlessness when he ruthlessly killed an unarmed hostage; it was Hershel who urged Rick to rediscover his own humanity; it was Hershel who gave the speech two episodes back about choosing how we live, and not merely that we do. It is Hershel who recognizes that survival is more than just being alive, and he continues to believe that despite what happened to Sophia. Hershel, better than most of the other survivors, understands the need to not just live, but to live morally, even in the face of apocalypse. Hershel understands that life, alone, is not living if one sacrifices humanity for life. In fact, this — if anything — is the thesis of the entire comic, and by extension the show, a fact that those (arguably) Bad Fans who advocate in defense of Carol’s actions seem to have missed. The series doesn’t propose why Hershel has such wise insight — his age, his schooling, his fatherhood, his faith — but I find it ironic that the man so conventionally close to death (according to age) is the one most morally and spiritually alive of the survivors. But, this episode explores the costs — tangible and intangible — in that philosophy. In addition to his efforts to slow the onslaught of the Megaflu, Hershel also emphasizes the importance of not killing victims of the Megaflu in front of the living. Again, this rule seems arbitrary and pointless — a point Glenn makes when he asks how they will cart the corpse of one patient down several flights of stairs — but Hershel insists: the damage done by loss of hope and morale, he says, is worse than any physical damage that the Megaflu might exact. It is clearly inevitable that the longer the Megaflu persists without treatment options, the more likely the Infected will succumb to hopelessness. Yet Hershel fights to protect every additional moment of faith and optimism among his patients, by carting away the dead to be dispatched out of view of the living. Even in himself, Hershel hopes to protect his own squeamishness at killing a formerly living soul by covering the face of a recently dead survivor before stabbing him in the head — possibly because he believes that squeamishness means he is still able to view his fellow survivors as people; contrast that to Carol’s attempts in the season premiere to force Lizzy to dispatch her own recently-bitten father. Which, let’s face it, is a traumatic thing to force upon a child, even in a zombie apocalypse. The tug-of-war between the two extremes of Hershel’s protectiveness versus Carol’s forced exposure finds Lizzy at the fulcrum. Lizzy is clearly a disturbed child, who fails to grasp the full reality of the world she lives in. When a number of Infected die without being locked in their cells, and Hershel is the lone able-bodied person in the cell block to ward them off amid the chaos (which he does with his trusty shotgun from Season 2! 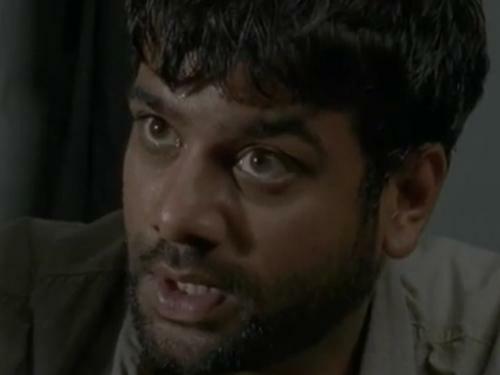 ), Lizzy is found at the center of the chaos attempting to persuade the red-haired survivor-turned-Walker from the episode opening to follow her as if he were some sort of pet. Arguably, this kind of innocence demands greater exposure to the realities of zombiedom, which happens when Lizzy falls and is attacked and nearly mauled by her former “pet.” We are forced to wonder if this is the end result of the innocence Hershel is trying to protect by locking Lizzy and Mika in a cell away from the Walkers and refusing to shoot Walkers in view of them. On the other hand, the inevitable fate of a child like Lizzy in a post-apocalyptic world is Carl, who in this episode is depicted as having grown almost fully into manhood despite Rick’s earlier efforts to stuff him back into the box of childhood. Left alone at the outer fences when Maggie runs back to the cell block to try and rescue Hershel and Glenn (she is alerted by the sound of gunshots), Rick requires Carl’s help when the outer fence that he and Maggie were trying to barricade falls and the outer boundaries are overrun by a Walker mini-horde (not to be confused with the Megahorde of two episodes ago). In this moment, the inevitability of Carl’s adulthood becomes clear to Rick as Carl capably accepts a crash-course in using a a sub-machine gun to help his father clear the Walkers who threaten the Prison’s inner walls. This is perhaps the first episode where Carl is convincingly accepted as an ADULT member of the group, as Rick realizes there’s no going back to him being a child now. Although Carl is clearly a badass in this scene, a later scene gives us moment to pause: Rick shares an intimate moment with his son as an equal, while giving him a fresh bean from their crop. While this is Rick treating Carl as an equal, we also see this “harvest” as the end of Carl’s developmental childhood. Has Carl’s premature aging been fair to him, or has he been cheated by life? Is turning Lizzy into Carl — a ruthless killer — while inevitable something we should hope to hasten? 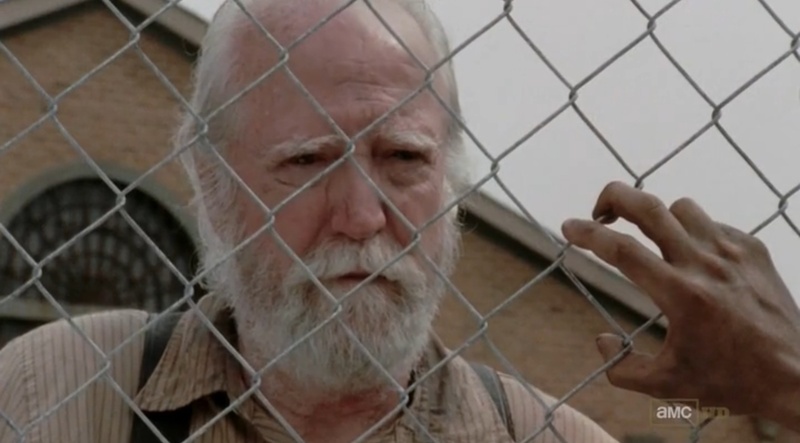 Just as if it seems certain that hope might be futile, the episode ends with a measure of redemption for Hershel’s faith. Not only are he and Maggie able to defy the odds and salvage a respirator bag for Glenn that saves his life, but Daryl and the others do indeed arrive in the nick of time with the much-needed medication that we, the viewer, are led to believe mean that Hershel’s hope in the face of overwhelming odds was justified. However, this comes at a cost: Hershel is about to pray over the corpse of Dr. S. (who died from the Megaflu and was killed by Hershel), but he is unable to — perhaps because he is too exhausted to muster the energy for faith, or perhaps because that faith has been shaken. We end with Hershel reduced to tears in his cell, and in so doing are reminded of the fragility of that humanity that Hershel seeks so desperately to protect in both himself and in his fellow survivor. To that end, Hershel is not only the community’s doctor, but de facto spiritual counselor. At its core, this incredible episode was about the nurturing of humanity and faith as well as the mere biology of life; furthermore, it emphasized the tremendous costs and rewards that come with fighting the seemingly inevitable slide towards ruthless anarchy that faces the survivors. Foreshadowing perhaps, as the episode concludes with the defeat of one seemingly momentous threat — the Megaflu — only to introduce two more overwhelming and inevitable threats looming on the horizon. The first is a danger that could shake the cohesiveness of the group: Rick must tell both Daryl and Tyreese that Carol murdered the Infected and that he let her leave, an act that is almost guaranteed to profoundly impact the group’s dynamics. Secondly, and perhaps more terrifyingly: the Governor is back. This episode, which was powerfully carried by character actor Scott Wilson as Hershel, was easily my favourite of this current season. Tune in next week as we find out what the Governor has planned. Lingering questions: Are the Infected alright? Who will be the first to beat up Rick for letting Carol go — Tyreese or Daryl? Who is feeding the Fence Walkers? Who was the voice on the radio in the car? Will the survivors be able to refortify the outer fence? And, what does the Governor have planned, next? Next Next post: Whoa – new layout?